When Bellator Fighting Championships hits the Aragon Ball Room a couple local fighters will be on the fightcard. Kevin Knabjian and Ryan Williams are set to take part in the night’s festivities. Both are welterweights training at Midwest Training Center in Schaumburg. Knabjian(10-3-1) is back home after briefly participating in “The Ultimate Fighter: Team UK vs. Team USA.” He lost his qualifying fight to close friend, training partner and fellow Chicagoan Mark Miller. Before appearing on the reality show he was riding a four-fight win streak which included a TKO stoppage of TUF1 alum Josh Rafferty at XFO 22. 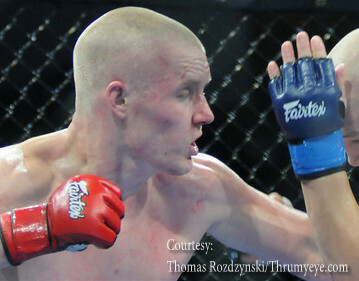 The former Eastern Illinois University wrestler has also fought in the WEC, losing to Brock Larson, who was the top contender to Carlos Condit’s welterweight title at the time. Knabjian’s opponent will be Jacob Volkmann(8-0), a three-time All-American wrestler from the University of Minnesota who now trains at Minnesota Martial Arts Academy. This is the same gym where current UFC heavyweight champion Brock Lesnar trains, as well as former UFC champions Sean Sherk and Dave Menne. Ryan Williams(10-3) is fresh off a strong performance at XFO 29 where he choked out Jason Bowling. The former XFO welterweight champion is keeping up a dizzying pace for a professional mixed martial artist. His upcoming Bellator fight with Anthony Lapsley will be his fifth fight in seven months. Lapsley(13-5) is a King of the Cage veteran and sports a nickname of “The Recipe.” Although he has several wins by submission, he is a fighter who likes to strike on the feet. The main events in the May 15 Bellator show are the semi-final bouts of the middelweight tournament. Veteran Dave Menne faces Omar De La Cruz and the hard hitting Lyman Good squares off against Jorge Ortiz. A tape delayed broadcast of the event will air on ESPN Desportes the next day.